It was a pretty solid week of training and a week of learning lessons! Monday: I had the evening off from the barre studio, so I was able to get my Monday workout in after work for once. I was glad too, since I had 1:10 on the bike in my Training Peaks. The workout was a mentally challenging one of two times through 5x2 minutes at Z5 with a minute rest and 10 minutes between sets. My legs were on fire by the end! 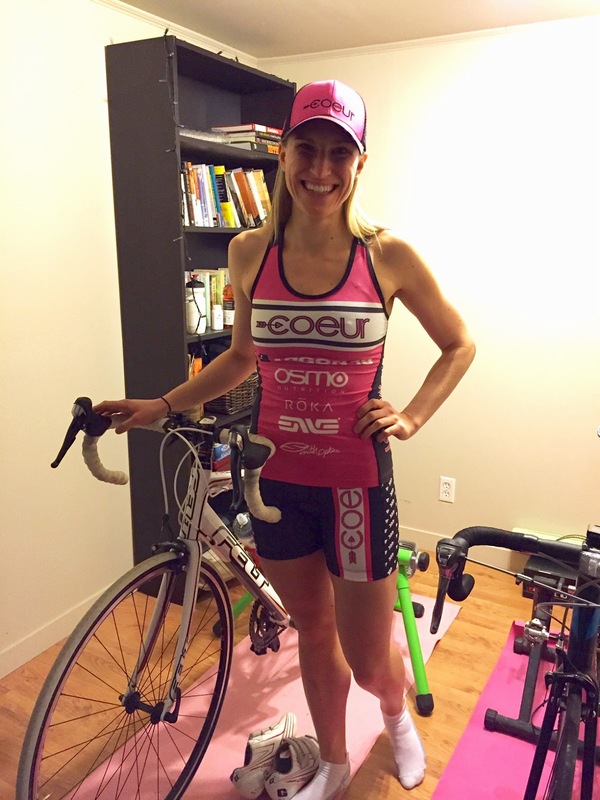 I sported my new Team Coeur Sports kit though to give me an extra push of #heartandcourage. Tuesday: Early morning swim with ROCS. I did about 4000m before calling it quits since my lane mate was on a rest week and she got out early. Main set was two times through 4x100 on 1:35, 3x100 on 1:30, 2x100 on 1:25 with 20 seconds rest between. Wednesday: I got away at lunchtime for a nice, hard 40 minute progression run along the Rideau Canal. It was a "warm" day and by the end I had really worked up a sweat! The evening was spent with my HPS family at our TTP class. I attempted a 20-minute power test, only to have the machine shut down on me. While it was tough mentally to have my 8 minutes gone to waste, it was also a relief since the next 12 minutes were going to be super hard. My love for the bike just was not there last week at all. It has always been my greatest source of struggle, and I have to work really hard to stay positive about my cycling. Luckily, I have supportive training partners and coaches to keep my spirits up! As usual, we did our strength circuit. I'm a big fan of the one we are doing this month, it has a lot of core strength and glute / hip stability work! Just what I need! Thursday: It was a BRUTALLY cold day in Ottawa, so instead of running outside, I hopped on my trainer for an hour of easy riding. I listened to the second episode of "Serial" and tried to focus on a nice, efficient and smooth pedal stroke. Friday: Up again for my 6 am swim. This time we did 4600m with a main set of all out efforts (50s and 100s) and lots of rest. My tummy was not pleased though, so it made for a bit of a rough go, but I pushed through and got it done. Saturday: A long and fun day of activities! We started with track practice at the Dome. It was great to have Jenn there to chase as we went through a pyramid at 1500-3k pace (200-400-600-800-800-600-400-200). It felt pretty solid! I went straight to teach two barre classes, then after a quick lunch, Jenn, Eric, Gilly and I made our way to Mooney's Bay to try our hand at skate skiing! Gilly gave us some pointers and we made our way through pretty heavy snowfall. I looked a bit like Bambi, with skis and poles flailing everywhere, but it was a really lovely day. Sunday: Another day of skate skiing! This time we ventured to Gatineau Park. It was the first "warm" day in a long time and it was so nice to be outside. Dave came with us and so generously shared his knowledge and patiently helped us to learn the proper skate skiing technique. I was quite frustrated though since everyone else seemed to "get it," whereas I struggled to get my body coordinated and moving. Dave reminded me that patience is necessary and that I will feel that much more accomplished from having to work to learn how to ski. I had to overcome some fear along the way too. Somehow skiing down a hill that I bike several times a week in the summer is a much more frightening prospect than riding down it. But I survived, and as frustrated and discouraged as I was at the time, I can appreciate how beautiful the park is and how much fun skiing will be if I keep at it. Look at all of your snow!! I have yet to get out and skate ski this year - there is no snow - which is unheard of around Central Oregon. We always have snow in the mountains. The winter sport fanatics have been pretty grumpy! Hopefully we will be getting some snow in March - we need it or we will have a really bad fire season! Your Coeur kit rocks! Love the colors - girly and fierce!!! It fits you perfectly. Oh no! Hopefully you get some snow! Skate skiing is getting easier after another weekend out practicing.